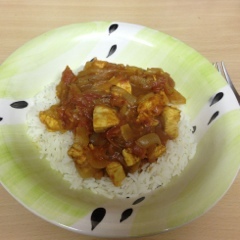 Slimming World Diary: Chicken Curry .. I have had a really bad week this week. I have no idea what's wrong with me, I've just been snacking so much, I can't stop. I've hardly got any exercise in as well. This week has be a total write off, which is upsetting because I only needed 2lbs for my 3 stone award. I know only have myself to blame but there has been no motivation in me. When I woke up this morning I had to give myself a stern talking to, I've started a new week from now. I'm not prepared for what the scales are going to say tomorrow but I will just have to deal with it and move on. I'm so disappointed in myself. So today I went for a syn free meal of quick and speedy chicken curry. Absolutely no snacking today. It's real easy to make, for something quick but also delicious. If you own the SW iPhone app the recipe is on there. If not here it is. 1. Place the onions in a frying pan with 1/4pt/142ml water and the stock cube, then cook, covered, for 10 mins. Add the garlic and curry powder to the mixture and cook for a further 5 mins. 2. Add the chicken and tomatoes plus another 1/4pt/142ml water. Bring to the boil, cover and simmer for 15 mins. 3. Boil some rice and serve. Makes 4 servings, or if like me, makes one and 3 for the freezer. So all in all I am now back on it, and this week needs to be forgotten. 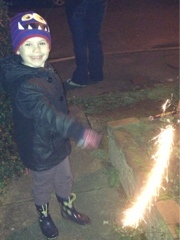 Also as an added bonus here's a pic of my son this evening, enjoying a sparkler. Ha ha.